Thanks to Dr. Anshu Jain and Professor Veena Maheshwari, Jawaharlal Nehru Medical College (India) for contributing this case. To contribute a Case of the Week, follow the guidelines on our Case of the Week page. (1) We are looking for Authors to write or update about 5 or more immunostains, routine stains or CD Markers. Help pathologists throughout the world do a better job by reading your work, and add to your CV. Click here for more information. (2) We posted 2 new Management page articles this week: (a) The Wrath of the Titans Falls on Physicians and Consumers, by Jacob Vugrinac of Vachette Pathology and (b) ICD-10 Is Here for Pathology, by Bill Gilbert of AdvantEdge Healthcare Solutions. (3) For October 2015, we averaged a record 22,688 visits per day (up 6% from last year), and had a record 703,355 total visits. Our Jobs pages received a record 46,934 visits, the Fellowship pages received 6,800 visits and the Conference page received 10,180 visits. We posted 48 Pathologist job ads in October. 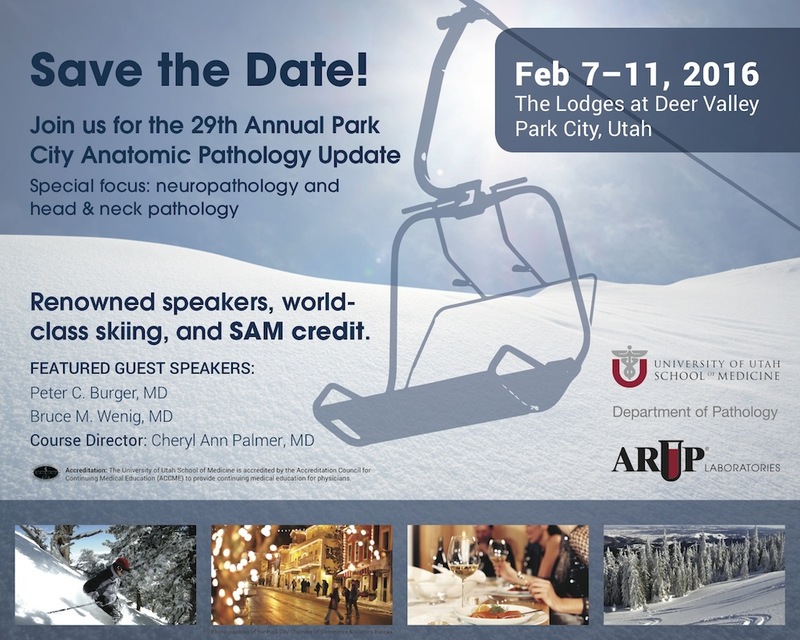 Thanks to everyone for your continued support and to those who stopped at our booths at CAP '15 and ASCP '15 to give us feedback. 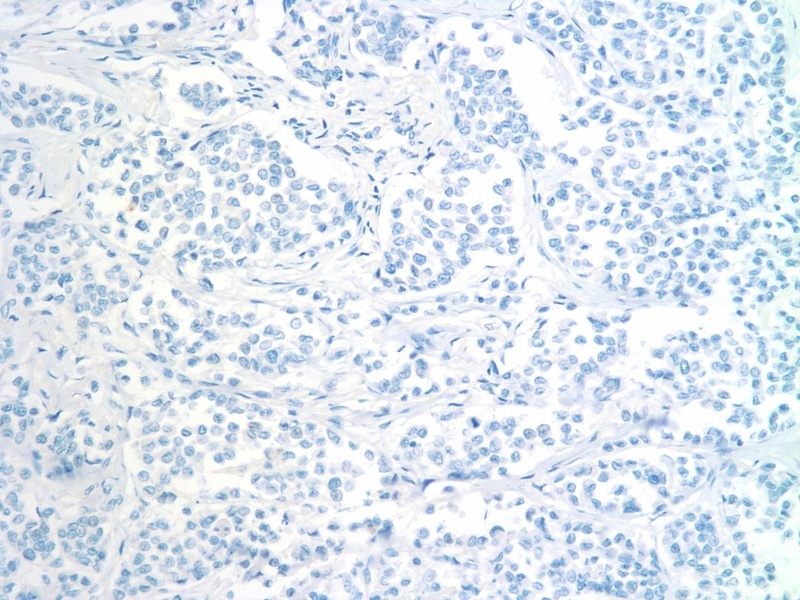 A 60 year old woman had a right breast tumor with skin ulceration, which was excised. Invasive lobular carcinoma (ILC) accounts for roughly 10% of invasive breast cancer cases, and differs from classic invasive ductal carcinoma with respect to risk factors. Invasive lobular carcinoma is more strongly associated with exposure to female hormones, and therefore its incidence is more subject to variation. Risk factors for developing ILC include early menarche, late menopause and late age at first birth (Breast Cancer Res 2015;17:37, JAMA 2003;289:1421). 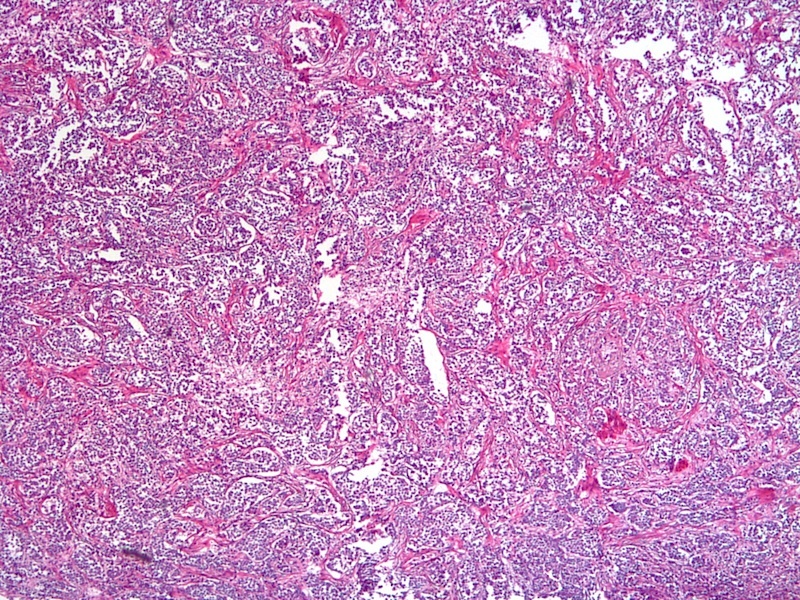 Several histopathologic variants have been described, including solid, alveolar, tubulolobular and mixed. A diagnosis of classical ILC should be restricted to lesions with a single file architectural pattern in approximately 85% of the tumor, as patients with a variant form may have a less favorable prognosis (Am J Surg Pathol 1990;14:12). 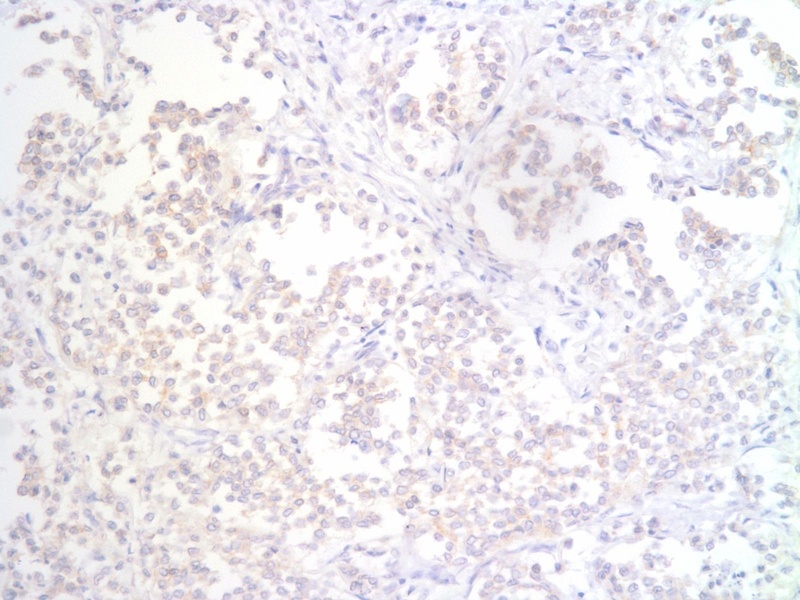 Histopathologic characteristics of classical ILC include small and relatively uniform cells arranged in a single file, or "Indian file" fashion. 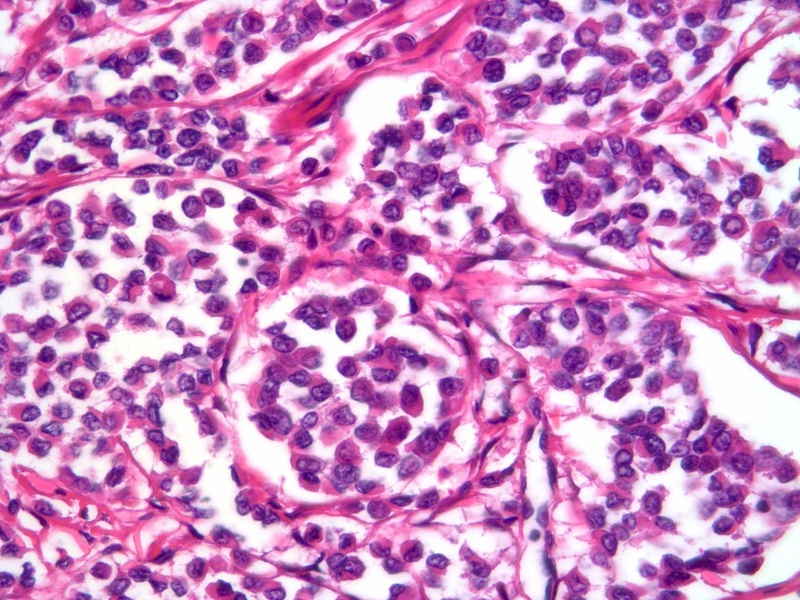 There is no gland formation, and the stroma is usually abundant and dense. 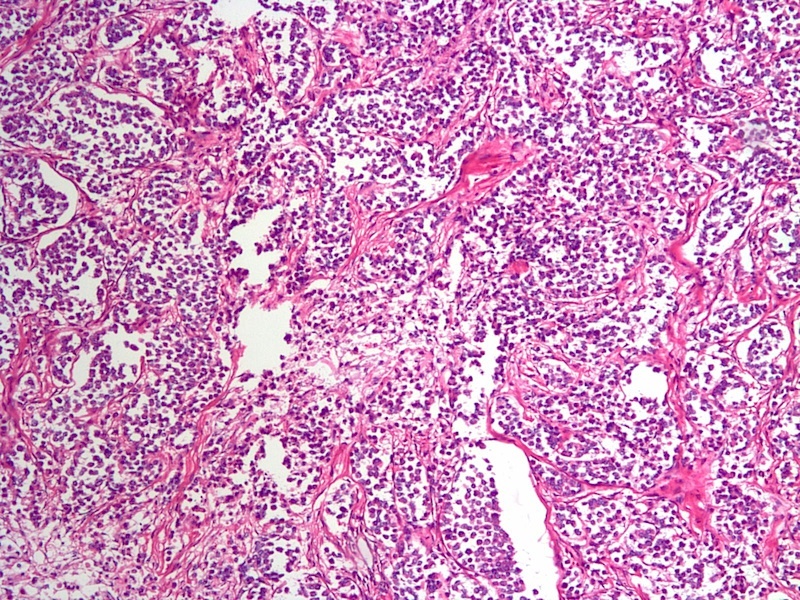 In the alveolar variant of ILC, the tumor cells are arranged in sharply outlined groups separated by fibrous tissue sometimes containing osteoclast-like giant cells (Rosai and Ackerman's Surgical Pathology, 2011). 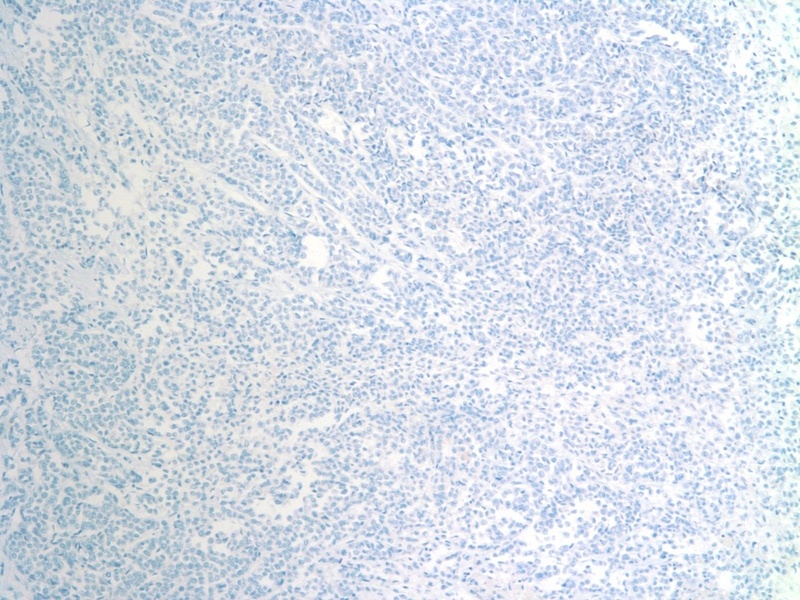 The solid variant features solid, sheet-like growth of tumor cells, and is not well seen in the above images. 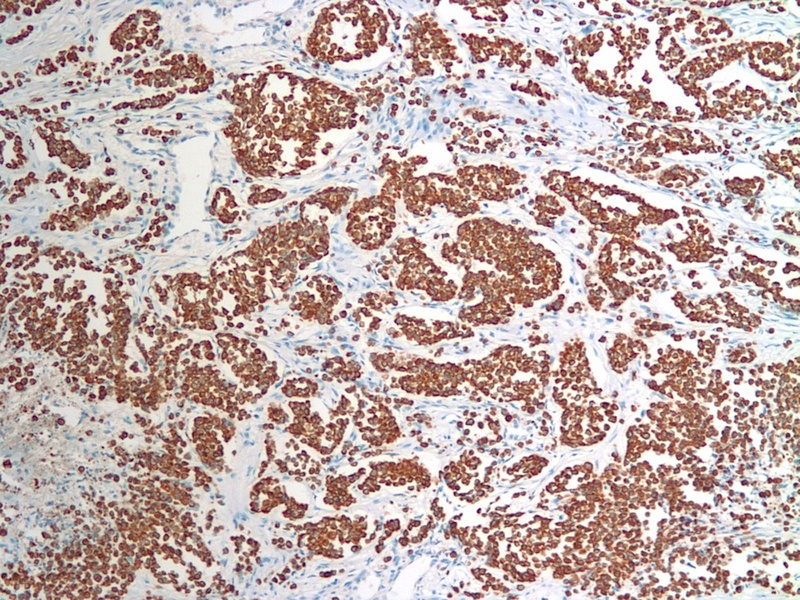 The immunohistochemical features of ILC include HMW cytokeratin positivity and most importantly, decreased or absent E-cadherin, although positive staining does not preclude this diagnosis if the morphologic features are compatible (Rosai and Ackerman's Surgical Pathology, 2011). The case at hand showed both ER and PR positivity in 25-75% tumor cells. HER2 was negative. The main differential diagnosis is invasive ductal carcinoma. The small size, uniformity and lack of cohesion among the cells of ILC are distinguishing features. 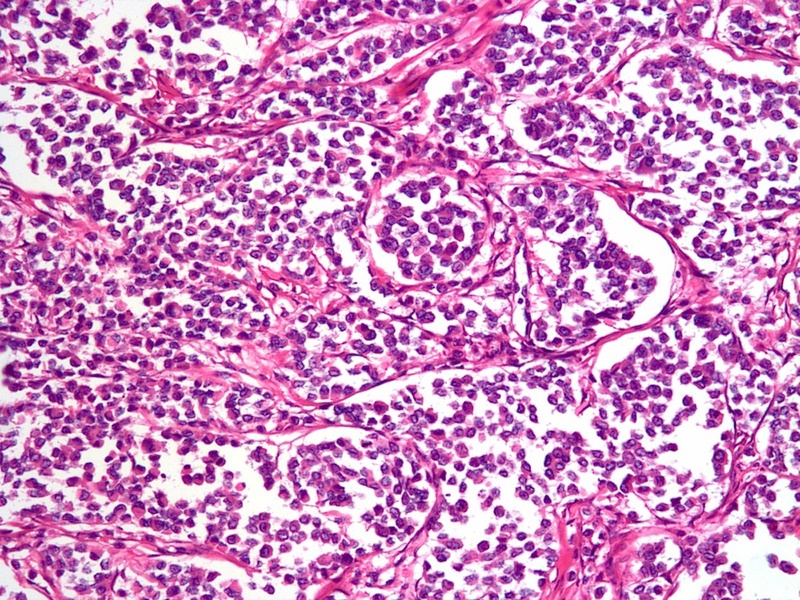 Other entities in the differential include carcinoma with neuroendocrine features and lymphoma. 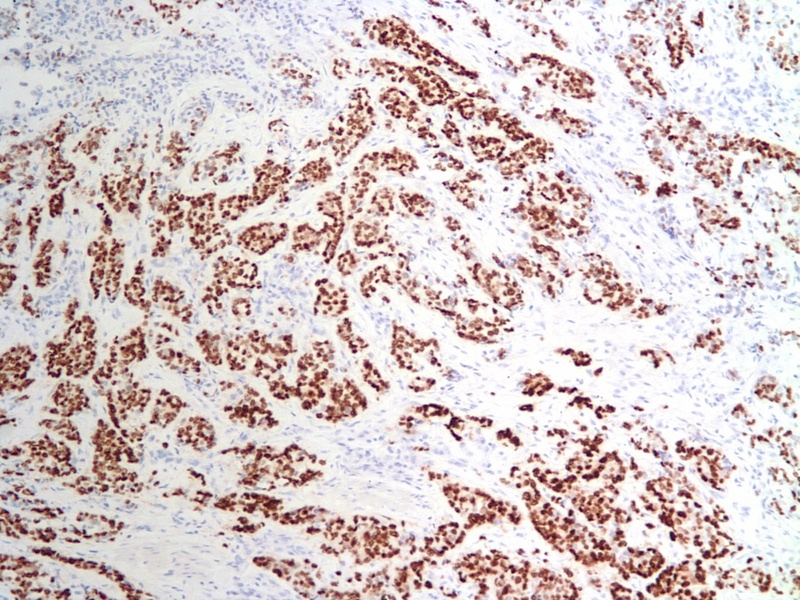 In our case, neuroendocrine carcinoma was excluded by negative chromogranin and synaptophysin staining. Prognosis is slightly better for patients with invasive lobular carcinoma than invasive ductal carcinoma (90% versus 88% 5 year disease specific survival). 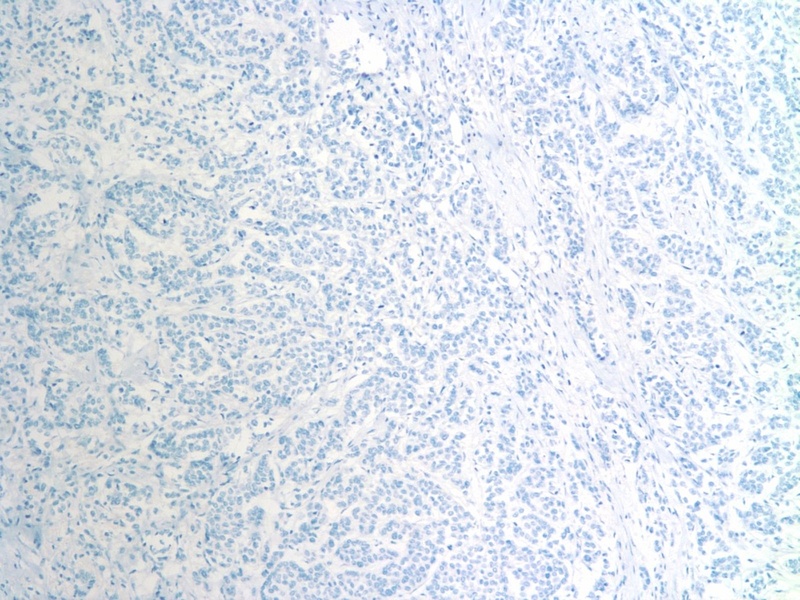 Classic invasive lobular carcinoma has a lower risk of nodal metastasis and usually lower tumor grade (Cancer 2008;113:1511). 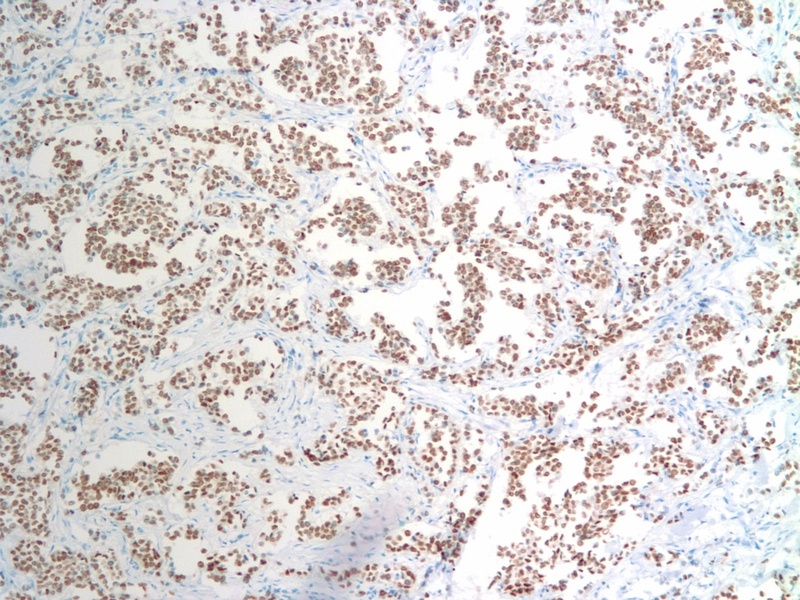 The alveolar variant has a high estrogen receptor concentration, and is probably a low grade malignancy with intermediate prognosis among the variants (Am J Clin Pathol 1986;85:1). The solid variant has the worst prognosis among the variants, with more frequent metastases and local recurrences (Br J Cancer 1989;60:605). Treatment options include a combination of surgery, chemotherapy and radiation therapy.